This year we’ve seen something unprecedented: the release cycle for Visual Studio has shrunk to just one year, and Visual Studio 2013 came out with some pretty serious improvements across the board. ReSharper, as you can imagine, always tries to provide a seamless development experience, so in ReSharper 8.1 we’ve added support for two VS2013-specific features: peek definition and the enhanced scroll bar. Finally, to make it even more convenient, we’ve added additional Ctrl-click shortcuts for more convenient navigation. Peek Definition can now be invoked by clicking while pressing Ctrl+Shift, and Go to Implementation can now be invoked by clicking with Ctrl+Alt. Visual Studio 2013 comes with an enhanced scroll bar — the vertical scroll bar area is now used not just to indicate position within the document, but also to indicate locations of code elements, Peek Definition windows, and so on. 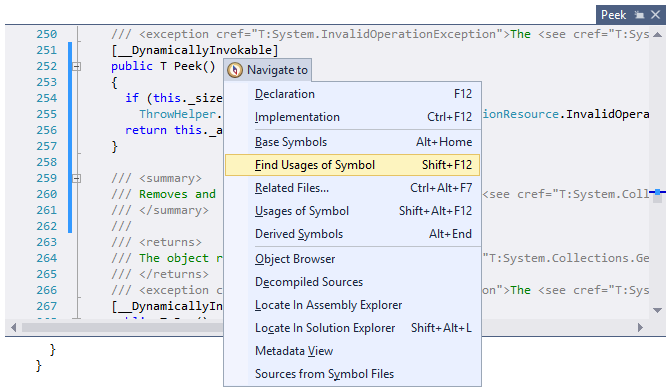 ReSharper now uses the scrollbar to indicate errors, warnings, hints and suggestions. The horizontal markers are, as always, clickable (a click takes you to the offending line of code) and have tooltips describing the issue at hand. Do not show error stripe hides the error stripe completely. Show error stripe bar shows the pre-VS2013 implementation of the marker bar as a separate bar. Choose this if you prefer the way things were in ReSharper 8.0 and earlier. Show marks over enhanced scroll bar is the option for integrating with the VS2013 scroll bar. If you choose this, you can also decide how big you want the error marks on this scroll bar to appear: we give you three settings to choose from. So with that in mind, we hope you enjoy having ReSharper 8.1 work in tandem with Visual Studio 2013. While we’re getting the final release version ready, check out ReSharper 8.1 EAP builds and let us know what you think! This entry was posted in How-To's and tagged EAP, navigation and search, ReSharper, ReSharper 8, Visual Studio, Visual Studio 2013. Bookmark the permalink. Very glad about this. I’ve used the Productivity Power Tools since VS 2010 and I’ve always found it very annoying that ReSharper and the Power Tools enhanced scrollbar didn’t integrate. I am finding that Go To Implementation no longer works in Visual Studio 2013 with Resharper 8.1. The other developers in my shop are experiencing the same issue. This is very important to us since we use a lot of dependency injection. Any chance this will be fixed in future builds? @Daniel @Lee we seem to be unable to reproduce this problem, though we have heard of it. If you’d be so kind as to give us a repro case over at http://youtrack.jetbrains.com, we’ll take a look at it. In the previous version it did. 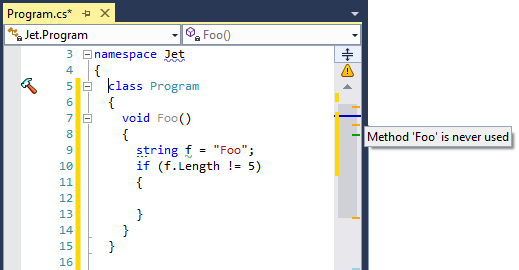 Resharper 8.1 creates a complete mess with VS 2013. None of my shortcut keys work any more after installing Resharper 8.1. Previously with VS 2012 plus Resharper 7 everything was fun. I’ve done cleaned installations but still no luck. Consider re-applying the shortcuts by going into ReSharper | Options and using the Apply Scheme button under the Keyboard & Menus navigation item. I’m having the same problem with 8.1 and VS2013 Premium, Version 12.0.30110.00 Update 1. I’ve tried many combinations of Resharper’s Apply Scheme, VS’s Reset Options, VS Repair, to no avail. Also unable to assign the keys manually using VS’s keyboard mapper. Resharper has had some form of this problem since 6.0, but usually by some combination of resetting/repairing I can fix the problem. I haven’t found the right combination with 8.1 :-(. I am having all the issues described above. Is there a fix for this? guys, i had 8.2 installed prior to visual studio 2013 and post install of vs resharper did not show up. repaired resharper. still no resharper. rebooted machine. same result. do i have to completely uninstall/reinstall? [frustration]. thanks for the help in advance. I finally was able to get it working going into Tools / Options and selecting Resharper and clicking on the “Suspended” button, which apparently had it reconfigure itself. Do install as admin if possible. Also, not sure if this worked, but I went into my AppData folder and removed all, “Resharper” folders. This was OK for me because I had no settings I cared to lose. YMMV.